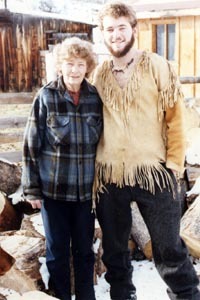 My grandmother mentored me in breaking the law. It wasn’t legal to pick up road-killed game along the highway, but she taught me that it was the right thing to do. My grandmother mentored me in breaking the law. It wasn’t legal to pick up road-killed game along the highway, but she taught me that it was the right thing to do. The key was to do it quickly, while nobody was coming. Roadkill deer were loaded into the back of her truck and brought home for gutting, skinning, and butchering. Good meat went into the freezer. Any questionable meat was a treat for the dogs. Fortunately, the 2013 Montana legislature legalized the use of roadkill game (limited to deer, antelope, elk, and moose). Although my grandmother passed away years ago, I know that she would have appreciated the new law. Montana’s new roadkill law applies to deer, moose, elk, and antelope. I asked around, but no law enforcement officer could offer a compelling reason why it wasn’t legal to pick up roadkill game, and they always seemed to be drawing straws, making up answers about issues such as safety, liability, or the risk of encouraging poaching. But I finally figured out the answer myself: It wasn’t so much illegal as merely unlegal. Montana had no law against picking up roadkill game, yet no law allowing it either. According to Montana’s fish and wildlife laws, game animals can only be taken by approved methods, and anything not specified in the rulebooks isn’t allowed. Thus, picking up roadkill game was illegal by omission. For similar reasons, it isn’t legal to hunt upland game birds, such as grouse, with sticks or rocks. By the letter of the law, one is required to cheat nature and hunt with a gun or a bow. I once dreamed of getting into state politics, and if I did, then I would have introduced legislation legalizing the use of roadkill game. But Steve Lavin (R-Kalispell) beat me to it. Lavin was previously a police officer. He and other police officers admittedly donated roadkill game to the food bank on occasion, even though it wasn’t exactly legal. Evidently, my grandmother was not the only outlaw! No doubt there were many other closet lawbreakers. It was the right thing to do. Montana is especially rich with roadkill game. There are only about a million people in the state, somewhat less than the combined population of deer, antelope, elk, and moose. I have enjoyed many roadkill deer over the years. Most were processed exclusively to fill the freezer with delicious steaks and roasts. Others were made partially or entirely into jerky and utilized as trail food for walkabouts and canoe trips. Processing roadkill deer is an essential component of our Green University® LLC internship program. Interns are encouraged to pick up roadkill game for processing. They learn how to properly gut, skin, and butcher the animals, as well as how to soften or braintan the hides and make fashionable buckskin clothing. Montana is especially rich with roadkill game. There are only about a million people in the state, somewhat less than the combined population of deer, antelope, elk, and moose. Montana is also the fourth largest state, with a lot of long, empty roads that are often driven a little too fast. 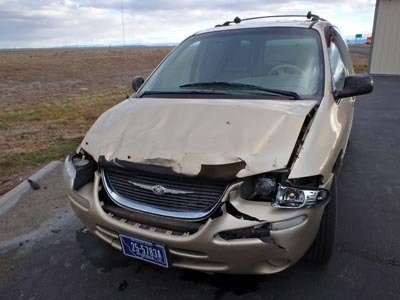 Thus, drivers face about a 1 in 77 chance of hitting a deer in any given year, compared with a 1 in 232 chance in neighboring Idaho. Drivers are most at risk of hitting deer during the fall breeding season. Deer disperse during the summer while the females raise their fawns, but group together in the fall and winter. The late season routine covers more area and takes the animals into unfamiliar territory. 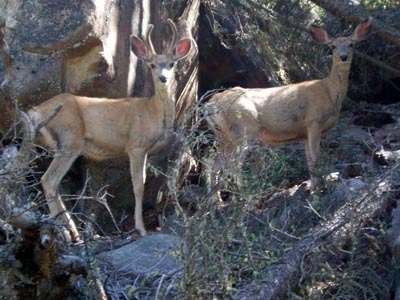 In addition, male deer wander more in search of females. The learning curve is steep, as vehicular selection removes a great many inexperienced deer from the gene pool. The survivors are less likely to be hit during the winter months, once the herds have established a familiar routine. Mortality rises again in the spring as the herds separate once again. To avoid a collision, it is important to reduce speed in the spring and fall during the evening, night, and early morning hours. To avoid a collision, it is important to reduce speed in the spring and fall during the evening, night, and early morning hours. Be especially careful where irrigated alfalfa fields line the highways. Whitetail deer breed like rabbits on the rich food. Driving these corridors can be a bit like running the proverbial gauntlet. The odds of colliding with a deer is substantially higher in these few key locations than elsewhere in the state. Drivers who blow by at seventy miles an hour without full light are courting disaster. In addition to the unfortunate death of the animal, the damage to a vehicle can run into the hundreds or thousands of dollars, and passengers are often injured and sometimes killed. Nationwide, about two hundred people die in collisions with deer every year. By that measure, these docile creatures are the most dangerous wild animals in North America! Montana’s new roadkill law makes the best of a bad situation. It is good news for Montanans. Any family of limited means can now put healthy, organic free range food on the table and thereby save money and improve their financial situation. Moreover, they don’t need to buy a gun or a tag or wait until hunting season to feed the family. Anyone who is thrifty like me will no doubt butcher their own, but other people will haul roadkill game to the butcher shop, providing additional four-season employment. Montana’s roadkill law applies only to roadkill deer, antelope, elk, or moose. Salvaging other roadkill game, such as pheasants, grouse, geese, mountain lions or bears, still isn’t legal. (However, no permit is required for nongame roadkill, such as rabbits or coyotes.) The law was supposed to take effect October 1st, but wrangling over the rules and procedures delayed implementation of the law until November 26th, 2013. The final rules are very user friendly to anyone interested in salvaging game. In addition to the unfortunate death of the animal, the damage to a vehicle can run into the hundreds or thousands of dollars, and passengers are often injured and sometimes killed. A “Vehicle-Killed Wildlife Salvage Permit” is required for each animal taken, but the permit is presently free. A law enforcement officer can issue the free permit if they happen to be at the scene of the collision. Otherwise, individuals are required to apply for a permit online within twenty-four hours after picking up an animal. 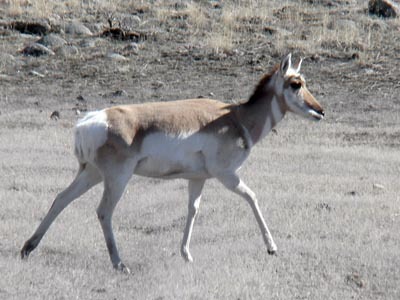 The permits serve as a tracking system for wildlife officials to watch for signs of misuse of the program. 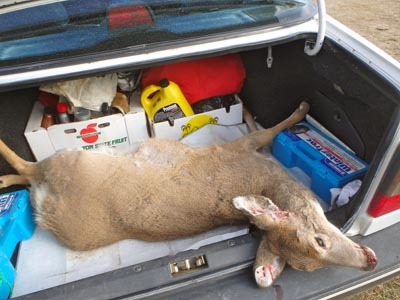 Law enforcement officers may occasionally require inspection of the animal, parts, and meat and/or they may ask to see where the animal was picked up along the road. It is a sensible check-and-balance system to help reduce abuse of the program by poachers who might shoot game and try to claim it as roadkill. Salvaged game must be entirely removed from the roadway by the permittee. It is okay to field dress the animal on site, but the entrails and all other parts of the carcass must be removed to avoid attracting scavengers and predators to the roadside. The meat must be used for human consumption and may not be used as bait for hunting predators. And despite anecdotes to the contrary, the Montana Food Bank Network officially does not accept donations of road-killed game. One aspect of the rules I question is that citizens are not supposed to kill animals wounded in collisions. The individual is expected to call a law enforcement officer to the scene to finish the job. However, the more humane thing to do is to put the animal out of its misery right away. A blunt instrument to the head, such as a crowbar or tire iron, is highly effective. Death is instantaneous and humane, and it is the moral thing to do. Aside from that issue, I wholly support the new roadkill law, and I am glad to have competition for the resource from other Montanans. I would rather come home empty-handed, knowing that the meat went to someone else’s freezer, than see perfectly good meat go to waste on the side of the road. I believe my grandmother would have felt the same way. Thomas J. Elpel is the founder and director of Green University®, LLC and Outdoor Wilderness Living School (OWLS). He is the author and producer of numerous books and videos. Harvesting and processing roadkill game is detailed in his book Participating in Nature: Wilderness Survival and Primitive Living Skills and expanded upon in his forth-coming book, Foraging the Mountain West: Gourmet Edible Plants, Mushrooms, and Meat.